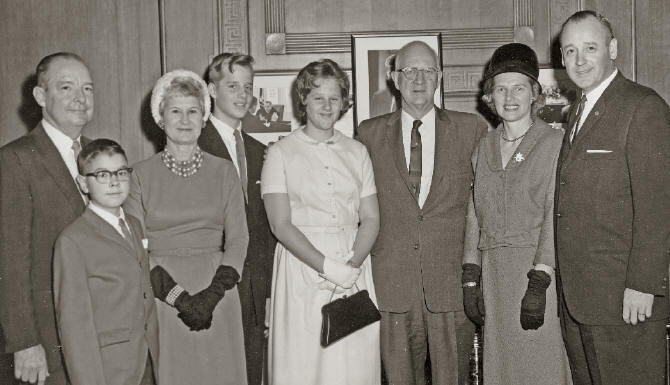 Perhaps more than anyone, Helen C. Hartzog has served as the “first lady” of the Park Service. Helen Carlson was born in Boston in 1923 to a large family that was deeply engaged in its community. She developed a love of music at an early age and later attended Boston University through an extension class in its school of music. This vibrant, talented young woman met George B. Hartzog, Jr. during World War II when he was temporarily stationed in Boston. George Hartzog, a lawyer from a humble southern agrarian background, would later become a director of the National Park Service, and the powerful partnership between him and Helen would have a profound and long-lasting effect on that agency and on the national parks. In 1947 George and Helen began their married life in Chicago where George joined the NPS as an assistant attorney in NPS headquarters. Less than six months later, the couple moved to Denison, Texas, where George administered the leasing program at Lake Texoma National Demonstration Area. Inspired by the people she met at the site, Helen quickly began to construct an NPS “family” around her to include hosting a Thanksgiving dinner for park employees. It was during these early years in the parks, she later explained, that her husband “made me understand the Park Service and what it was about.” The Hartzogs soon came to share the same powerful life-long vision of what the national parks should be and what they should mean to the American people. In 1955 NPS officials transferred the couple to Rocky Mountain National Park where George became assistant superintendent. It was here, Helen later recalled, that she came to appreciate more fully the importance of taking care of the staff and visitors in the parks. In one instance, a park visitor had dropped off her two young sons to hike on one of the trails. When dusk began to fall and the boys had still not arrived at the designated pick up station, the distraught mother contacted park officials. While the rangers searched for them, George brought the mother home to Helen who comforted her through the night as best she could until her sons were returned safely. This episode had a profound impact on Helen, reaffirming her belief that “living in the park was living with your family.” She routinely helped park families settle in or fixed dinner for them. With no movie theater inside the park, she started a supper club on Friday evenings where park staff could relax and enjoy each other’s company. Two years later the family moved to Great Smoky Mountains National Park where George became assistant superintendent. Once again Helen quickly immersed herself in the park community, entertaining park staff in her home and even starting a weekly social where employees and their spouses could make baskets or do other crafts. After a brief period back in the NPS Washington headquarters, in 1959 they moved to St. Louis where as superintendent of Jefferson Expansion Memorial George successfully launched the construction of the Gateway Arch. George and Helen raised their three young children (Nancy, George III, and Edward) inside the parks and quickly came to appreciate how much park families cared for each other and supported each other. Helen learned this lesson well and carried with her throughout her life. As we have seen she became deeply involved in the life of each park where they were assigned and made promoting a sense of community a high priority. “We were as much park people as our ranger-husbands,” she explained. In St. Louis, the Hartzogs once again became engaged in the community and initiated Park Service family gatherings, to include hosting Christmas gatherings for the children of all the employees at the Gateway Arch. On one occasion she temporarily transformed the basement of their residence into a French café where park staff could socialize. When George became director of the National Park Service in January 1964, Helen continued to foster that sense of community but on a broader scale. The “family” concept that she had embraced years earlier expanded beyond the boundaries of a single park to the entire Park Service. In 1963 she and her husband purchased a farmhouse with a few acres outside Washington in McLean, Virginia, where they could raise their children among a few farm animals and garden. The Hartzogs fully appreciated the importance of personal relationships, and Helen believed the entertaining helped advance his vision for the NPS. With her gracious manner, she warmly welcomed guests to their home. Soon after George’s appointment as director, the Hartzog family hosted a sit down dinner for several hundred people at their home In McLean with many of the guests arriving on Greyhound buses. The dinner marked a dramatic beginning for the entertaining Helen would do during her husband’s tenure, to include dinners for Congressional representatives, a dinner for Ansel Adams, and a book signing for Secretary of the Interior Stewart Udall. These gatherings gave the director the opportunity to advocate effectively for NPS priorities and programs. Preparing for them involved the entire family, with Helen preparing the meal, Nancy and Edward setting the table, George III helping guests park their cars, the director greeting the guests, and all three children serving as “waiters.” More frequent were short notice dinners for NPS regional directors, Washington staff, and visiting park superintendents. Always a gracious host, Helen also recognized and respected the limitations on her involvement in official park business. She humbly described her role as that of a “helper.” Whatever George needed done, she explained, they did. In fact, she became very skilled at navigating a complex organization and delicate situations. At her dinners, she created a relaxing environment with a sense of comradery where NPS employees could candidly discuss their concerns and collaborate on solutions. Helen’s life-long love of music was very much a part of the Hartzog household. As her reputation as a musician grew, she was often asked to play the piano at the dinners she and George hosted. The resulting sing-alongs would often last well into the evening. No doubt many Park Service programs and issues were discussed informally by those gathered around her piano. 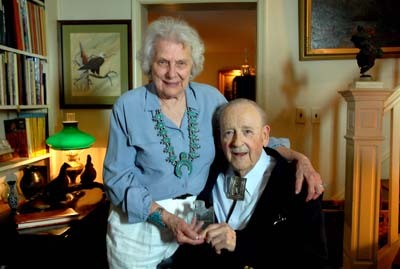 One of the Park Service’s greatest supporters, Laurance S. Rockefeller, took great pleasure in her music and would ask her to bring her music to his New York home when the Hartzogs visited so that they could sing together. George credited much of his success to Helen, who served as one of his most trusted advisors. She often accompanied George on his trips to introduce politicians and others to the national parks and potential sites for inclusion in the national park system. Helen became so skilled at fishing on some of these trips that she often brought home the trophy fish. Meanwhile, she always kept oatmeal cookies rolled up in the freezer and bottles of lemonade on hand to serve Park Service friends who stopped by unexpectedly. This became part of the ritual, especially when young rangers from Harpers Ferry National Historical Park would come for the day to meet with the director as part of their training. Though she no longer bakes the cookies herself, the hospitality and generosity continue, and Park Service friends who visit can still look forward to gingersnap cookies and lemonade. One of George’s initiatives as director was a program designed to give visitors the experience of a site as it existed historically called Living History. Helen became personally involved at Arlington House in Virginia, putting together a program with volunteers dressed in period costume who would play music and entertain the secretary of the interior and other senior officials at the Arlington House. Helen continued to find ways to contribute to the NPS after her husband left the agency in 1972. Her husband had started the Volunteers in Parks (VIP) program in 1970. The number of volunteers quickly grew from 300 to more than 257,000 today. At one point, she concluded that the efforts of these volunteers deserved formal recognition and suggested this to her husband who wholeheartedly agreed. They donated funds to the National Park Foundation to begin an award program for the volunteers and continued to fund that program. The George and Helen Hartzog Awards for Outstanding Volunteer Service continue to this day and recognize the hard work, skills, and contributions of exceptional volunteers, groups, and park VIP programs. In addition, both Helen and George placed a high value on education and wanted to provide educational opportunities to the children of NPS employees. In 1974 they established what continues to this day as the George B. Hartzog Jr. Educational Loan Program, which offers interest free educational loans through the NPS Employee and Alumni Association. For her many contributions over the years, the Coalition to Protect America’s National Parks has awarded Helen an honorary membership . Helen Hartzog not only worked to preserve her husband’s legacy, she became an integral part of that legacy. Yet, her important behind the scenes role in support of the National Park Service and the parks themselves has never been fully recognized. At age 92 she continues to speak with passion about the NPS “family” that has meant so much to her and the vision that she and her husband shared. *All the quotations used in this piece are drawn from oral history interviews with Helen Hartzog conducted by NPS Oral Historian Lu Ann Jones in 2009.